Creation, self-care, and skill-sharing—Concordia’s Art Hive provides a serene environment where everyone can create. Run by the school’s creative art therapy students, this space provides students and the university’s community with a place to relax, decompress and work with a variety of creative materials. The Art Hive works to provide an inclusive space for the community, with the intention to connect, share skills and create. There are a variety of Art Hives located across Montreal, which provide community connection and artistic resources to varied neighbourhoods throughout the city. Concordia’s very own Hive is free, open to all, and wheelchair accessible. It also works with the university’s Centre For Creative Reuse (CUCCR) to provide recycled and reused materials, creating a sustainable foundation for art-making. This space is dedicated to students’ creative expression, without judgement, whether they have previous experience with the arts or not. Students use it for self care in periods of academic stress, to work on creative school or community projects, or to meet other people from diverse backgrounds around a constructive activity.” – Rachel Chainey, Art Hive Network national coordinator. Its location within a university arguably heightens the significance and value of the Art Hive’s mandates and resources. In an academic environment that generates a lot of stress, intensity and focus on productivity, the Art Hive provides a space for people to remove themselves from that environment and take time to relax, be creative and work without an agenda or a deadline. The Art Hive is for people of all disciplines, whether fine arts or any other department of study. Artistic spaces can often be intimidating and may appear or act as an exclusive environment, deterring some from becoming involved. 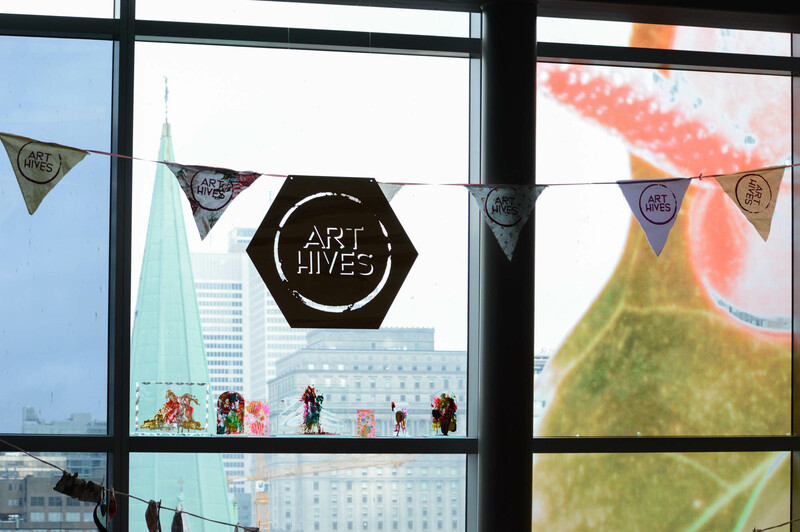 The Art Hive is a resource specifically for the community, and its mandates work to make sure it is inclusive, accessible and comfortable for all. For those who are experienced in fine arts, the Art Hive provides a more relaxed space to create and practice a craft, contrasting with the typical academic format of deadlines, critiques and specific criteria. Instead, students can create without these pressures and perhaps find further inspiration for their other work. In studying fine arts and creating work exclusively for a curriculum to be graded, the magic and joy in art can be lost, to a certain extent. By providing an environment specifically for the wellbeing of the community, with no structure or need for a specific finished product, fine arts students can once again find their passion and inspiration, or just create artwork in a space focused on providing peacefulness and freedom for all. With ties to art therapy, the Art Hive uses creation as a therapeutic practice. Along with its regular scheduling and space, the Art Hive also offers a Pop Up Art Hive at the Zen Den in the university’s Counselling and Psychological Services department space. The space works to give visitors a calm, comfortable environment to decompress and practice mindfulness, while also having support and staff on-hand for those who are struggling or simply need some support. The mental wellness aspect of the Art Hive is another major component of the organization and what it can provide to the community. As students, mental health—which can be affected by stress, anxiety and feeling overwhelmed—can be a prominent concern. It’s not always easy or accessible for students to reach out or receive help for these concerns. It is also often difficult to acknowledge the need for extra support. This space has direct ties to therapeutic practices and removes some of the potentially daunting aspects of reaching out for help, while still working to provide a form of relief or aid through its format. The accessibility of the Hive comes into play here-everyone is welcome. The Art Hive is also just an enjoyable place to be. While there plenty of benefits tied to wellbeing, mental health and student life, the space also provides an environment to create, experiment and connect with others. With its inclusivity, accessibility and flexibility, the Art Hive truly provides a great space for the community. It can be a wonderful resource for students, addressing and acknowledging a variety of needs and working to provide a comfortable space for all. The Art Hive is open on Mondays from 12 p.m. to 4 p.m. and on Thursdays from 4 p.m. to 8 p.m. on the 5th floor of the EV building. The Pop Up Art Hive at the Zen Den is open from 1 p.m. to 3 p.m. every other Tuesday.